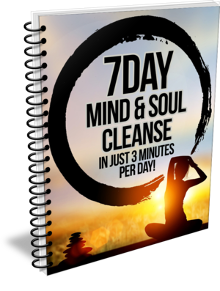 You'll receive my email mini-course plus the "7 Day Mind & Soul Cleanse" workbook. Use this to declutter your mind and soul, so you can live your best life! Each day you'll get a simple 3-10 minute exercise to cleanse and rejuvenate specific areas of your life as well as prime your mind to make the most of the day. This mini-course is delivered in 2 parts. Part 1 you'll receive immediately in the downloadable ebook, and part 2 you'll receive in your email each day. Enjoy the Mind and Soul Cleanse. I look forward to hearing how you enjoyed it.